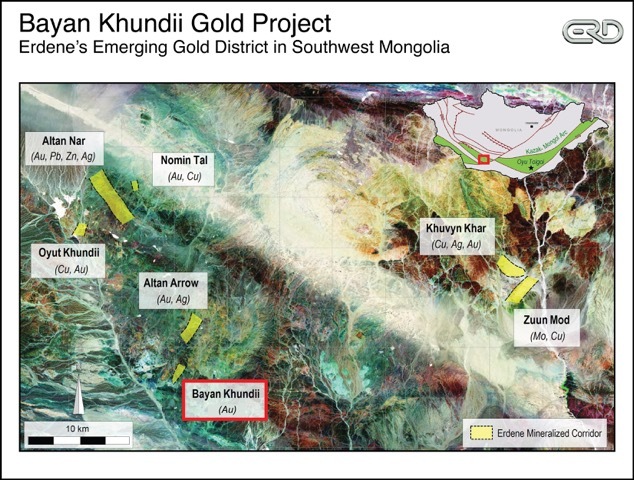 Erdene Resource Development Corp. ("Erdene" or "Company"), is pleased to announce results from follow-up drilling on the recent high-grade discovery at the Company's 100%-owned Bayan Khundii Gold Project ("Bayan Khundii") in southwest Mongolia. 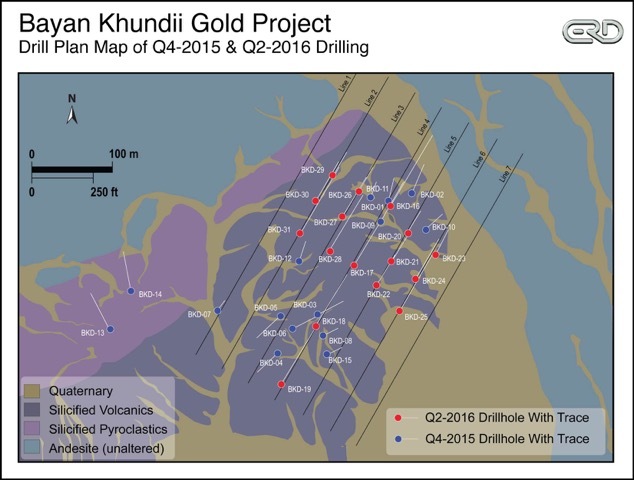 Drilling in Q2-2016 has intersected additional high-grade gold mineralization including 5.3 g/t gold over 63 metres in hole BKD-17 in the Striker Zone, one of multiple high-priority targets within the Bayan Khundii prospect area. The results reported today are for the first seven holes of an extensive exploration program that includes a planned 30 diamond drill holes. Included with this release, for reference, are two plan maps and two cross-sections. (i) Reported intervals are not true width. They represent drill intersection widths from holes drilled at a 45 to 60 degree angle. The Bayan Khundii mineralization is interpreted to be moderately dipping (approximately 40 to 50 degrees) perpendicular to the drill hole angle. The Q2-2016 Bayan Khundii exploration program will include 3,500 m of diamond drilling, approximately 900 soil samples over a 7.6 km by 3 km area, 35.4 line km of gradient IP geophysical surveys, 33 line km of dipole-dipole geophysical surveys, 550 m of trenching and sampling within a 2 km by 2 km area, and mineralogical studies. The majority of this work is complete with the exception of drilling; approximately 1,700 m of drilling remains in the program. Results for 1,012 m (7 holes) are being released today and approximately 700 m of drill sample material is currently being analyzed, with all results anticipated during Q2-2016. The drilling program was designed to test the strike and vertical extent of the high-grade gold mineralization discovered in Q4-2015 (previous drilling tested to less than 50 m depth). The first seven reported holes were drilled to depths of 50 to 232 m or approximately 35 to 150 m vertically. All holes are drilled perpendicular to the interpreted dip of the mineralized zones. 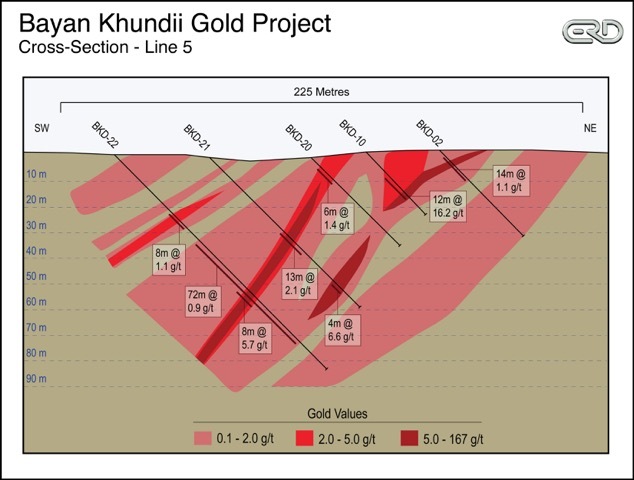 In addition, various technical studies in support of future scoping/feasibility-level studies and a mining license application, including hydro-geological, archaeological, paleontological, and environmental base line studies, have commenced on both Bayan Khundii and the Company's Altan Nar gold-polymetallic project located 20 km to the northwest. Trenching and mapping within the Northeast zone has confirmed the same intensity of alteration with associated anomalous gold mineralization supporting a large interpreted northeast-trending zone of alteration and gold mineralization. Bayan Khundii is a low sulfidation epithermal gold system with all of the primary lithologies (volcanic tuff and andesite) pervasively altered by multi-stage, locally intense, silica and sericite alteration. The locally intense silica-sericite alteration (SS2) overprints the pervasive silica sericite alteration (SS1) and commonly forms selvages (halos) around quartz veins, fractures, and hematite/specularite veinlets, as well as selvages surrounding disseminated hematite and other inclusions. Extensive hypogene hematite and specularite mineralization occurs as veinlets, mineralized fractures, locally disseminated, and infilling of breccia zones, including common hematite-quartz breccias. Quartz veins and breccias occur within all altered lithologies and include comb textured quartz, saccharoidal (sugary) quartz, recrystallized quartz (intensely silica altered) as well as chalcedonic quartz. The gold mineralization is associated with quartz veins, quartz breccias, within hematite-specularite veins and fractures, within altered host rocks including along margins (alteration selvages) of quartz veins and disseminated within the altered host rocks, often, but not always, associated with disseminated hematite-specularite mineralization. Gold grades within the host rocks, excluding the greater than 1 g/t material, average 0.1 to 0.2 g/t gold. The recent drilling supports much wider zones of gold mineralization than previously recognized, ranging from previously untested gold mineralization north of the Striker zone with 83 m of 0.59 g/t gold in hole BKD-16, to the high grade intersection in hole BKD-17. Gold mineralization is generally observed to be fine grained. The current drill program will include continued testing of the Striker Zone as well as Gold Hill, Westridge, Stockwork and now the newly defined Northeast Zone. It is anticipated that this phase of the Bayan Khundii exploration program will be completed in June 2016 with all results received by the end of Q2 or early Q3. On completion of the program the Erdene technical team will be interpreting all results and establishing plans for the next phase of exploration with a follow-up drill program anticipated in Q3-2016. In Q2-2015, Erdene conducted an initial exploration program on the southern portion of the Company's 100%-owned Khundii license. This reconnaissance work led to the discovery of the Bayan Khundii ('Rich Valley') gold prospect, located 20 km southeast of the Company's flagship Altan Nar gold-polymetallic project. 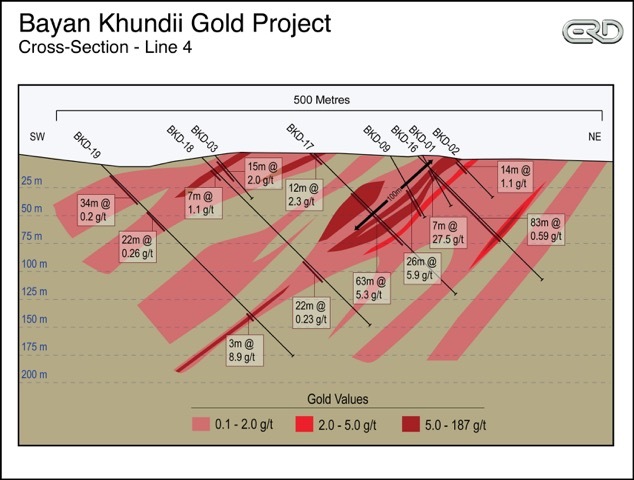 Subsequently, gold mineralization at Bayan Khundii has been identified in three separate prospect areas over a 1.7 km trend, with detailed exploration only taking place over a 475 m by 300 m zone in the southwest prospect area, where the Company's Q4-2015 drill program (totaling 695 m) was completed. Visible gold was observed in 10 of the 15 initial drill holes and results included several high-grade intersections within a series of parallel structures exposed at surface. Results included up to 35 m of 5.9 g/t gold in hole BKD-10 (including 12 m of 16.2 g/t gold) from surface to the bottom of the hole. The details of that drill program can be found in Erdene's December 14, 2015 news release (click here for link).